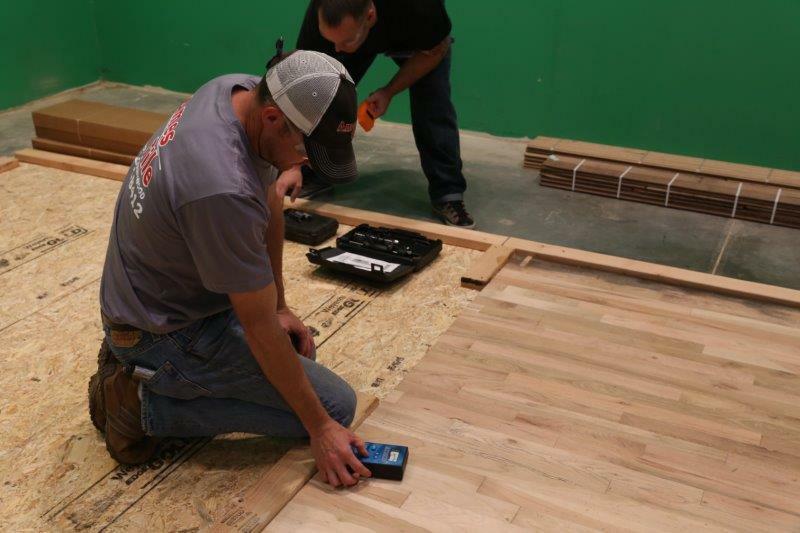 Acclimation is one of the most critical steps to ensuring a successful wood flooring installation. The process involves allowing wood to reach its equilibrium moisture content (EMC) within the environment in which it will be installed. To understand how this works, it’s important to understand how wood performs as flooring. Wood is a hygroscopic material, which means it gains and loses moisture in response to changes in temperature and humidity within the surrounding environment. When wood gains moisture, it swells; when wood loses moisture, it shrinks. When wood is neither gaining nor losing moisture, EMC has been reached. Relative Humidity EMC Chart – courtesy of Lignomat. Wood technologists have graphs that precisely tie moisture content, relative humidity, and temperature together. For example, at 70℉, a relative humidity of 25% produces a moisture content of 5.4%. At the same 70℉, a relative humidity of 75% produces a moisture content of 14.4%. This 50% increase in relative humidity produces a moisture content change of nearly 10%. How that affects wood flooring depends on the species used. 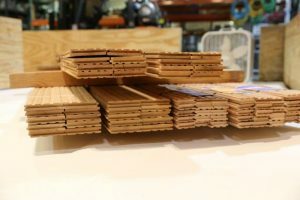 Let’s assume the width variation for a 2¼” white oak board is 1/16“. Over 16″ of flooring, that variation equates to a full inch. Expand that even further over the width of a 10’-wide floor, and the variation amounts to more than 3” of total expansion or contraction. This example clearly illustrates the importance of wood flooring acclimation. Store the flooring material at the jobsite under controlled environmental conditions. Garages, patios, breezeways, and other areas exposed to uncontrolled conditions are not acceptable storage areas. A. Determine what the expected seasonal change of temperature, humidity, and moisture content is for the geographical location. B. Ensure the environmental conditions are within the normal range. C. Check the moisture content of the wood flooring using a moisture meter. D. Identify a moisture content base line. Note that this base line does not represent the final EMC required for that environment. Thus, the acclimation process is often required to customize the moisture content of the wood flooring to the interior environment in which it is expected to perform. Pinless moisture meters can be moved across the flooring surface to identify elevated areas of moisture. 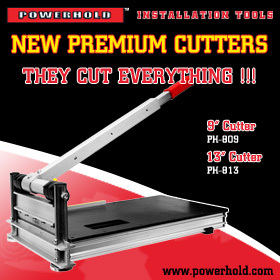 These meters do not leave any holes in the flooring, so do not damage the flooring surface. Pin-type moisture meters measure the electrical resistance across opposing sets of pins, which must be pushed into the wood to get an accurate reading. Since the pins are inserted into the wood, small pinholes will be visible on the flooring surface. In general, temperature and grain direction do not affect readings for pinless meters, but do affect readings for pin-type meters. Follow the meter manufacturer’s instructions. Once conditions are adequate, test a minimum of 20 areas per 1,000 square feet and average the results. Document all readings, and pay special attention to exterior walls and plumbing. Any excessively high readings should not be included in the average. 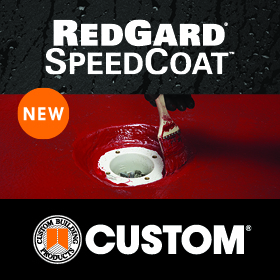 Installation should not proceed until the origin of the moisture is identified and remedied. 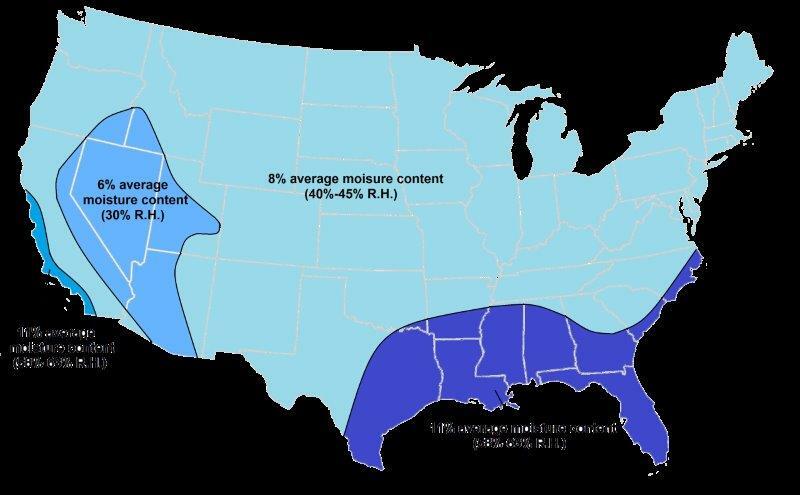 It is important to note that moisture content and relative humidity vary significantly for different regions. Regional averages are available, but these are dependent upon numerous variables, including construction type, HVAC systems, elevation, and lifestyle. These averages should be used only as a reference. Wood flooring should not be acclimated to these averages if the end-use environment does not correspond to the averages. Ultimately, it is the responsibility of the flooring professional to know the ideal conditions for the jobsite, and to install the flooring only after those conditions are met. 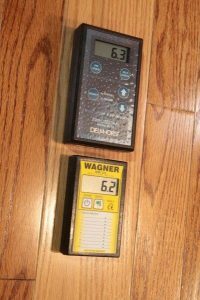 Check the moisture content of the wood flooring as soon as it is received at the jobsite. Ensure heating and air conditioning units are operating. Ideally, this will be at least five days before flooring is delivered, during installation, and after the flooring is installed. If permanent HVAC systems are not available, a temporary system that mimics normal living conditions may enable installation to proceed. Establish the moisture content of the subfloor. 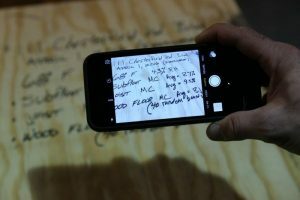 The moisture content of the subfloor should coincide with the temperature and relative humidity of the jobsite. This moisture content reading will give you a good idea of how the conditions in the facility are being maintained, and will allow you to compare to the expected in-use conditions. Expose the flooring material to the normal conditions of the environment in which it is being installed. To accomplish this, break the flooring units into small lots and/or open the flooring packages. 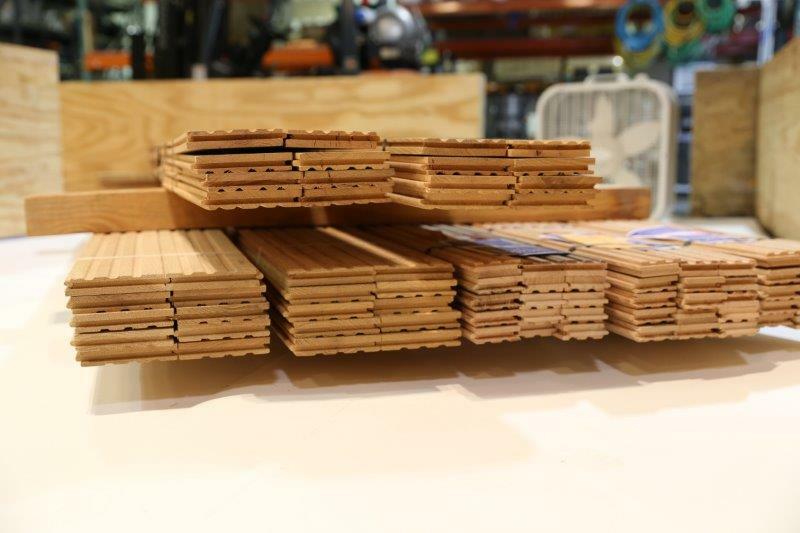 Cross-stack the material with spacers between each layer to allow air circulation on all sides of all boards. Stacks should be elevated from the subfloor. Acclimate the flooring material for as long as it takes to reach EMC. Some species will take much longer to reach EMC than others. It is never a good idea to base acclimation on time alone, but rather on actual moisture content. If the flooring material cannot be delivered to a controlled environment on the jobsite, then pre-acclimate the material in an off-site location set to mimic the expected conditions of the jobsite. 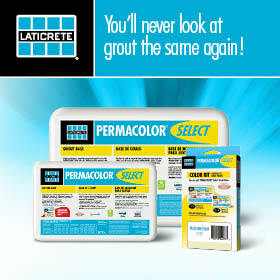 Then deliver pre-acclimated material to the jobsite once normal conditions are established. 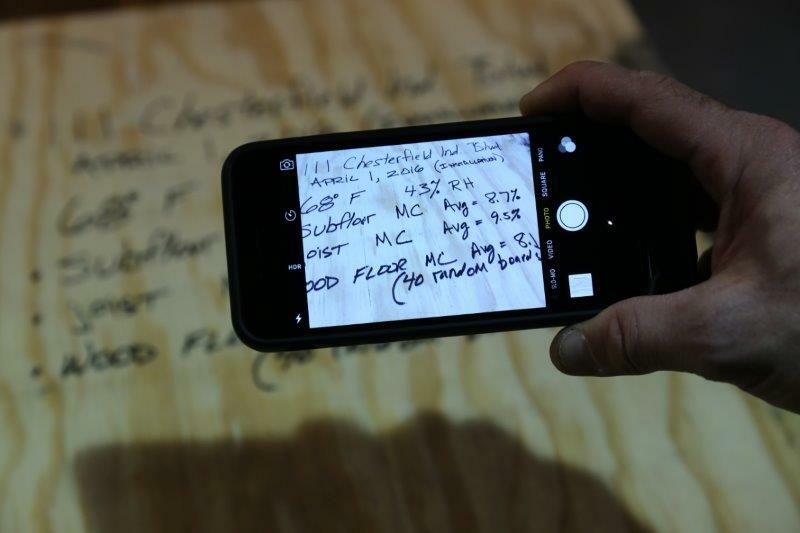 Verify that the flooring and wood subfloor moisture content is within the acceptable range for the jobsite. The moisture content of the subflooring material should be within 4% for solid strip wood flooring (< 3” wide), and within 2% for solid plank flooring (≥ 3” wide). If the moisture content of the subflooring and wood flooring are outside of these tolerances, then the flooring should not be installed. Most factory-finished flooring will define moisture content tolerances or specific acclimation requirements. Note that wood flooring is considered acclimated only after it reaches its EMC for the space in which it is expected to perform. EMC is based on an unchanging environment. After a wood floor has been installed, changing conditions within the environment will change the EMC of the wood floor, resulting in dimensional change such as gaps or cracks. Educating your customers to maintain consistent temperature and humidity levels within the environment year-round will help minimize these types of effects. The National Wood Flooring Association (NWFA) provides detailed information about acclimation and moisture testing in its Wood Flooring Installation Guidelines, which is provided to all members as a benefit. They are available to nonmembers for purchase. For more information, contact the NWFA at 800.422.4556 (USA and Canada), 636.519.9663 (international), or visit www.nwfa.org.